Sponsored by AMBICO Limited; Bison Innovative Products; Bostik, Inc.; Construction Specialties, Inc.; DORMA; Mitsubishi Electric Cooling & Heating; Mondo; NanaWall Systems; NUDURA; PITTSBURGH CORNING; and Soil Retention Products, Inc. Explore the condition of schools in the United States and the range of issues related to green school design. Define the fundamental criteria that contribute to a green school based on the LEED for Schools building certification program. 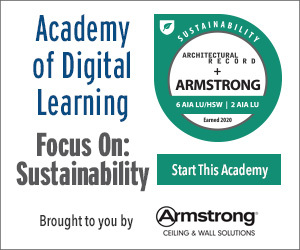 Discuss different strategies that can be used successfully to contribute to the design, construction, and operation of green K-12 schools. Identify programs and resources to assist in healthier, more productive, and more efficient green learning environments. According to multiple sources, there are more than 130,000 existing K-12 schools operating in the United States. New schools are also in design and construction either to accommodate growing needs or to replace outdated facilities. The significance of this sheer quantity of facilities certainly reflects the importance of education in this country, but the buildings have become more than that. In most places, schools are centers of communities providing a full range of events and programs for children, parents, and the general public. With all of this exposure, it is a bit surprising that many American citizens and public officials have a poor understanding of the scale of their presence and worse, of their typical physical condition. The Center for Green Schools at the U.S. Green Building Council has published the “2013 State of Our Schools” report, which estimates that it will take approximately $271 billion to bring public K-12 school buildings in the United States up to working order and in full compliance with current codes and standards. If we add to that the cost of modernization to ensure that our schools meet today’s education, safety, and health standards, it estimates twice that at a $542 billion required investment. An updated State of Our Schools report is due to be released in early 2016. While these figures present a sizable challenge to public school districts around the country, they also represent a huge opportunity for those involved in the design, construction, and operation of schools. It also presents the best opportunity to bring these existing schools into the 21st century using what has become the most defining characteristic of our time—green school design. 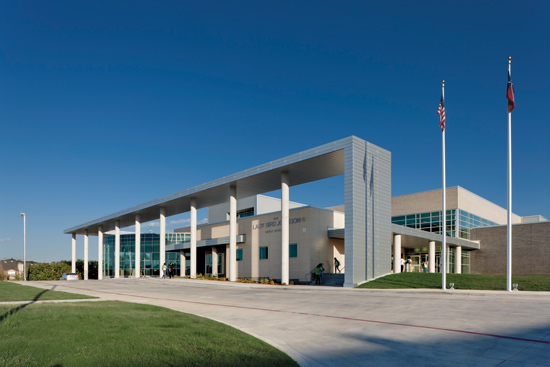 Photo courtesy of Mondo/Corgan Associates, Inc.
Lady Bird Johnson Middle School in Irving, Texas, is the first net-zero school in the state, and at 150,250 square feet, the campus is the largest net-zero educational facility in the country. A net-zero building produces as much energy as it consumes, so its overall energy consumption is net zero over the course of a year. The Center for Green Schools at the U.S. Green Building Council was founded in 2010 with an “ambitious yet achievable mission to put every student in a green school within this generation.” As such, the center works directly with teachers, students, administrators, elected officials, and communities to create programs, resources, and partnerships to transform schools into healthy learning environments. Their work intersects buildings, curriculum, and community, and building design professionals can use them as a great resource. For more information, visit www.centerforgreenschools.org . Green schools that follow a fundamental design and operational approach have been shown to reduce the environmental impact of buildings and grounds, have a positive effect on student and teacher health, and increase environmental literacy among students and graduates. This is because the green schools community, both in the United States and around the world, is aligned toward three aspirational goals for schools: zero environmental footprint (including energy, water, and waste), a positive impact on occupant health and performance, and 100 percent of graduates demonstrating environmental literacy. In 2011, the U.S. Department of Education launched its Green Ribbon Schools award program and has invited schools, as well as colleges and universities, to participate and demonstrate their success in meeting these goals. The U.S. Green Building Council is also well known for the LEED Rating System, which is often used as the basis for determining green school design and construction, and also for green operations and maintenance in existing buildings. The rating systems are generally organized into six credit categories, including Sustainable Sites (SS), Water Efficiency (WE), Energy and Atmosphere (EA), Materials and Resources (MR), Indoor Environmental Quality (EQ), and Innovation (IN) in either design or operations. Other credit is possible for things like Integrative Process, Location and Transportation, and Regional Priority depending on the specific rating system used. In the following portions of this article, we will look at 11 selected approaches and examples that can contribute to achieving credit in most of these categories based on currently available systems, technology, and products. The Center for Green Schools provides a full range of information and resources for architects and other design professionals engaged in the creation of green and sustainable schools. Education facilities demand quiet environments for both students and teachers. AMBICO manufactures industry leading, acoustic swing and slide door assemblies. Doors are available in steel or wood veneer. For all classroom, industrial shop, gymnasium, music room, auditorium, studio, or stage applications; make AMBICO part of your sound barrier solution. From multi-family, mixed-use, government facilities, healthcare, and more—Bison Innovative Products offer the design flexibility to create versatile, unique outdoor spaces. Since 1994, Bison has led the industry in the design and manufacture of adjustable pedestals and hardwood deck tiles that create beautiful rooftop environments. Ultra-Set® SingleStep2® utilizing Bostik’s AXIOS® Tri-Linking™ polymer technology, is the ultimate in high-performance wood flooring adhesives. It combines high strength adhesive, industry-leading moisture barrier, and sound abatement underlayment technologies all-in-one dynamic, space-age formulation. It also contains Bostik’s patent-pending Thickness Control™ Spacer Technology, ensuring ideal membrane thickness between substrate and hardwood flooring. Acrovyn by Design® provides unlimited visual freedom to incorporate digitally printed photography, branding and more behind legendary, PVC-free Acrovyn®. The 4'x8' or 4'x10' 0.040'' thick rigid sheet is perfect for protecting imagery and walls in high traffic areas. Now available on Acrovyn® Wall Panels to help create an even more stunning design. The M9000 Series Grade 1 heavy-duty mortise locksets provide exceptional security, refined aesthetics, and rugged dependability. These premium locks are designed for extreme reliability and durability, exceeding 13 million cycles in independently witnessed laboratory testing. PremiSys® Fusion DOAS systems deliver 100% outdoor air with over 20% greater efficiency than traditional DOAS systems. These systems maintain the quality and value of standardized products while earning valuable LEED® points. Learn more at MitsubishiPro.com/Ready. Mondo’s Advance rubber multipurpose indoor sports flooring is ideal for a wide array of indoor sport activities. Advance is highly durable and low maintenance, it provides outstanding sound absorption properties, and is slip resistant. It is GREENGUARD Gold certified and is 100% recyclable. NanaWall FlexSpace Opening Glass Walls eliminate fixed walls and create flexible shared spaces between multiple classrooms. Shown above in the NanaWall FoldFlat configuration. NUDURA Insulated Concrete Forms provide design professionals and architects the freedom and versatility to design and build a structure the way it was envisioned. Building with NUDURA ICFs gives you the opportunity to build faster, while offering you an eco-friendly structure with substantial benefits that contribute to long term energy savings. Glass block can be customized with messaging or artistic designs to enhance or complement the design of the building and classrooms. For example, a chemistry lab can have a glass block wall with the Periodic Table of Elements on it. Glass block can provide daylighting while enhancing the learning atmosphere of the classroom. Drivable Grass® is a permeable, flexible, and plantable concrete pavement system that can be used for a vast variety of applications ranging from pathways to parking lots and fire lanes. Drivable Grass® can be used as both a planted system, with grass or groundcover, and as a non-planted system, with artificial turf, rock, or decomposed granite infill.